Recent Winners – Dragster Adventure Challenge! Nov.18.2015What a Year for our Grads! What a grea t year! I just got back from the Auto Club Finals in Pomona and it was a fabulous race. Our former graduates did well. 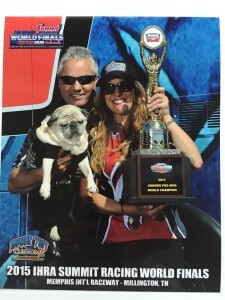 This year Erica Enders won her second NHRA Pro Stock World Championship! We first saw Erica in our S/C course several years ago. 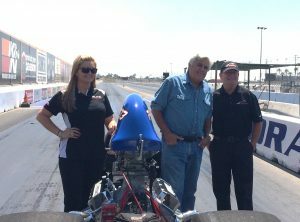 She then went on to get her Top Alcohol Funny Car license with us and just this fall Erica and I spent some time together helping Jay Le no learn to drive a Super Comp dragster for the premiere episode on his new show “Jay Leno’s Garage” which is featured on CNBC. If you missed it, you can still watch it on demand. Antron Brown won his second Top Fuel NHRA World Championship as well. Antron came to us to get his Top Alcohol Dragster license after a great career in Pro Stock motorcycle. He is a great guy and loved by everyone who knows him. His co-crew chiefs Brian Corradi and Mark Osw ald gave him a fabulous race car this season and Antron took advantage of it by clinching the Championship in Vegas before the final race. And my good friend and Drag School instructor, Jack Beckman came “oh so close” to a second NHRA World Funny Car Championship when he went down to the final few rounds in a battle with eventual NHRA champ Del Worsham for the title. In my mind, second place is pretty good in a field like they had this year. In fact 6 of the top 10 finishers in both Top Fuel and Nitro Funny Car got their start at our school…pretty impressive! There were also many other great performances from our grads in 201 5. 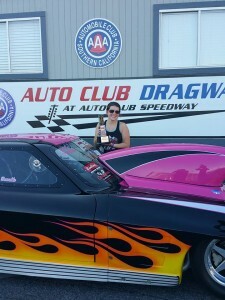 Dina Parise won the IHRA Pro Mod World Championship! 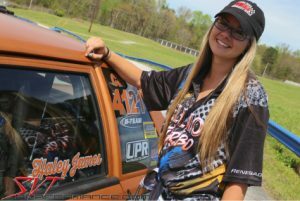 Haley James was the youngest and first female to win the NMRA Coyote Modified Championship! 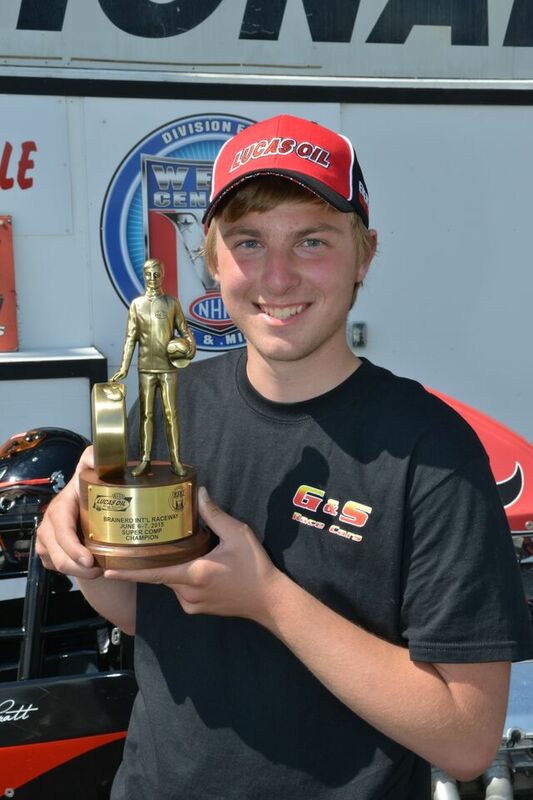 Jordan Pratt followed up his Division 5 Rookie of the Year by winning the NHRA Division 5 Super Comp Championship, along with the Midwest Drag Racers Association Points Championship! Emma Deuschle won her first race at the Fontana PSCA race this fall in her ’63 Corvette Split Window Top Sportsman class, and her brother Ricky also won in his ’02 Camaro Top Sportsman class, with sister Ashley taking runner-up in Top Sportsman. After all these years I’m still amazed at the success of our students whether it’s victory on the world stage or victory at their local track. We have truly been blessed to have met so many wonderful people and we thank them so much for their kind words and endorsements of our programs. If there is any way in which we can help you fulfill your dreams… please give us a call. In addition to the 2016 class dates we have already secured in Gainesville, Fontana and Norwalk, we will be adding dates very soon for Chicago, Indy, Denver, Maple Grove, and St. Louis. Please check our website for updates. Frank Hawley's News April 2019! West Coast Classes Coming Up! Aeromotive Named the Official Fuel System for Frank Hawley's Drag Racing School! 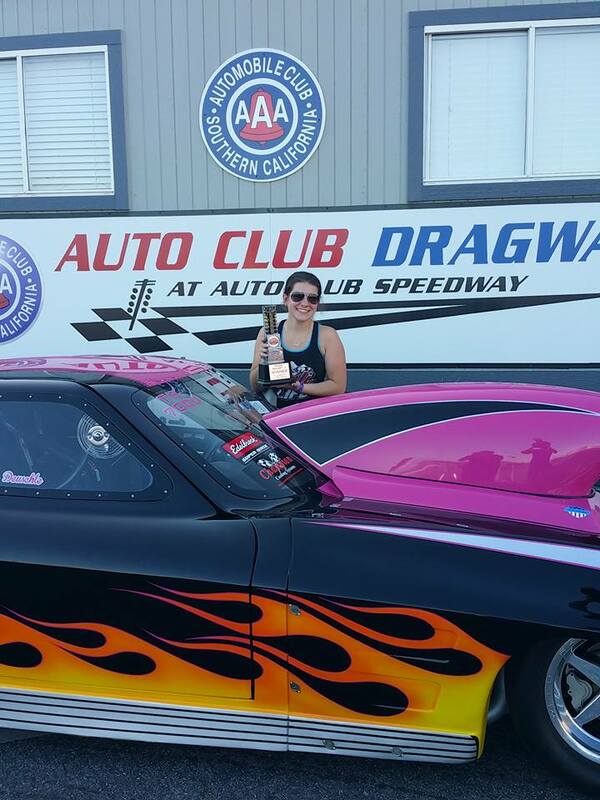 Auto Club Dragway, FontanaSuper Comp/Super Gas/Bring Your Own Car - Contact us to Book! The Strip at Las Vegas Motor Speedway - SOLD OUTSuper Comp/Super Gas/Bring Your Own Car - Contact us to Book! © 2014 Frank Hawley Drag Racing School. All rights reserved.